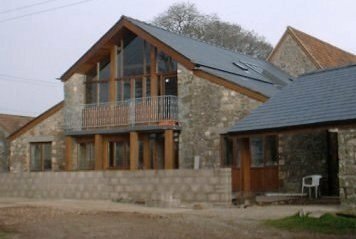 The practice handles a variety of projects ranging from the smallest house extension to medium sized commercial and educational buildings. These are mostly local but some of the larger projects may be further afield. The practice focuses on providing a friendly and high quality service which is responsive to its clients’ needs and budgets. We produce imaginative and practical designs which reflect our client’s aspirations and which have a positive response to their context. The practice is run by Peter Tyler Dip. Arch. (Hons.) who qualified as an architect in 1985 having trained at Cheltenham College of Art and Design and The Polytechnic of North London. His early career was spent with distinguished architects' practices in Central London and the South West before setting up in practice in Clifton, Bristol and then moving to Chepstow in the early 1990s. He has acted as project architect on many major commercial, housing, industrial and educational building projects. In accordance with UK law Peter is registered with the Architects Registration Board (ARB) who regulate the conduct and competence of Architects and look after consumers’ interests in their dealings with architects. If you are about to embark on a building project it is advisable seek professional advice from us at the earliest possible stage. The first meeting with us is usually free of charge and the advice we will give you should establish the viability of your project and its likely cost. We can also explain how the overabundance of planning and building law will affect your proposals. We will make clear to you the range of services we offer as architects and which of these services may be applicable to your project. After this first meeting you will understand how to move your project forward and we will be able to provide you with a written quotation of our services and fees which will be tailored to your specific needs. When you are fully satisfied with our terms and conditions the agreement can be formalised in writing in accordance with the ARB’s Code of Conduct. Please contact us for an informal chat about your project or send us email and we will contact you.